The best meteor shower of the year occurs in mid-December when ‘shooting stars’ appear to blast out of the Name A Star Live constellation Gemini. The peak of this year’s Geminid meteor shower occurs over the night of December 13/14 when, under optimal observing conditions (e.g., FAR from city lights), you may be able to see as many as 80 to 120 shooting stars per hour. But most people generally don’t observe under perfect conditions. Still, you should see quite a show! Also, if you’re busy the evening of December 13/14, not to worry: You can still see plenty of Geminid meteors between December 4 and 17. This meteor shower is called “The Geminid’s” because meteors appear to shoot out from the constellation Gemini. This year the “radiant” — the central point from which the shooting stars emerge — will be near the bright star “Castor” (at “A” in the diagram above). The bright star “Pollux” is at “B.” Castor and Pollux are the brightest stars in the constellation Gemini, which is outlined in this diagram. Also outlined here is the Name A Star Live constellation “Cancer” (at “C”). The best way to enjoy a meteor shower is to lie down in a lawn chair — along with friends and family, and maybe even the family dog — and look up. That’s it! No telescopes, binoculars or apps required. If you want to locate Gemini in the night sky, consider getting our planisphere constellation finder or our Virtual Planetarium™ software. But you don’t really have to locate the constellation to enjoy seeing shooting stars: Just lie down on your back and look up. The farther away from city lights you get, the more shooting stars you will see. The best time to see the meteors will be between roughly 10 pm and 2 am. But if you can’t stay out that late Thursday night/Friday morning, there will still be plenty of Geminid meteors to see this coming weekend. Be sure to dress for the weather, and bring along some food and drink. Enjoy! And here is a perhaps overly-dramatic video about this year’s Geminids: While the Geminid meteor shower is the best of the year, it is easy to overhype. Still, this video is nicely done: Take a look! The mighty planet Jupiter dominates the night sky in December. It also reaches “opposition” this month, meaning that this is a point in time when the Earth is directly between the Sun and Jupiter. That in turn means that this is the best time of the year to see Jupiter since it is so bright. Look for the brightest ‘star’ you see over the eastern horizon after sunset: That will be Jupiter! The king of the planets is located in the Name A Star Live constellation Taurus throughout the last month of 2012. The view facing east in the early evening hours during early December. 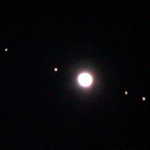 Jupiter (at “A”) is in the V-shaped group of stars known as the “Hyades,” marked by the bright star Aldebaran (at “B”). You may see the pretty group of stars called the “Pleiades” (at “C”). Many people confuse the Pleiades with the Little Dipper, which is located toward the northern horizon. Depending on your location on Earth, you may see the giant constellation Orion (“D”) rising above the eastern horizon. If you live in the southern hemisphere of Earth (e.g., Australia or New Zealand), these stars will appear ‘upside down’ to you. There’s been a lot in media this year about how the ancient Maya predicted the world would come to an end around December 21, 2012, or that “Nibiru,” a supposed planet discovered by the ancient Sumerians, is headed toward Earth. These are hoaxes. This image from NASA features, in the foreground, the famous Aztec calendar, while the background is a satellite image of the outer layers of the Sun. The Aztec calendar incorporates a mythological and calendrical system derived from earlier Mesoamerican cultures, including the Maya. The calendar, which was extremely accurate, was developed by observing the Sun’s motions in the sky over a long period of time. NASA Senior Scientist David Morrison does an excellent job refuting these — and other — end-of-planet-Earth hoaxes at LunarScience.NASA.gov/articles/doomsday-2012-fact-sheet. NASA has posted another excellent discussion on this topic at www.NASA.gov/topics/earth/features/2012.html . In fact, we’re so confident that these are hoaxes that, should the world come to an end December 21, 2012, we will gladly issue full refunds to all our Name A Star Live customers on December 22! But December 21, 2012 does mark the “Winter Solstice” — the point in time when winter begins in the northern hemisphere of Earth. It’s a wonderful time of the year, with snow falling, Christmas carolers singing, New Year’s revelers partying, and football fans cheering. We hope you have a very happy and safe holiday!